Home » Blog » 100 miles! We must be mad! Martin Smedley, Act4Africa chief exec, looks forward (?!) to this weekend’s 100 mile cycling challenge! “We must be mad!” my daughter, Grace, said to me last week as it dawned on us both that neither of us had ever tried to cycle 100 miles in under 8 hours, with two challenging hill climbs (Box hill and Leith hill en route). OK, we had successfully completed the Coast2Coast cycle ride together some years ago but that was 140 miles spread over 3 days! We are both what I would term, fair weather, occasional cyclists rather than lean, lycra-clad athletes, and this is an altogether tougher event. As a charity, Act4Africa has been encouraging supporters to take part in the Prudential Ride London event for the past 5 years, but this will be the first time that either of us have taken part. So far, I have been busy getting my bike serviced with new tires and having a “bike fit” to ensure everything is ergonomically correct to make it easier to ride. I have gone out several of times on training rides to get some miles in my legs, but poor Grace, has been experiencing a very busy schedule at work, which has limited her time for much training. However, Sunday morning 29th July at 8am we will both be on the starting blocks in the Olympic stadium in London ready to cycle the 100-mile Olympic course out to Surrey and back to finish on the Mall. We are doing this to raise much needed funds to fully equip Kathy’s Centre in Mayuge, Uganda. We are very proud of this community facility which arose out of my late wife Kathy’s dream to give the disadvantaged children of Uganda the best start in life with first class early years education. We have had some brilliant help along the way from the amazing Alistair Bryce Clegg at ABC Does and, last September, we opened the doors of our brand-new kindergarten to welcome twenty-five children to start their educational journey with us. Grace and I will be pedalling all day in conditions which are forecast to be as hot as Uganda and it will make it much easier for both of us to know that each mile is contributing to raising funds for the education of another deserving child. Thank you for your support. Martin Smedley is chief executive and co-founder of Act4Africa and his daughter Grace Smedley has recently joined the charity as a Trustee. 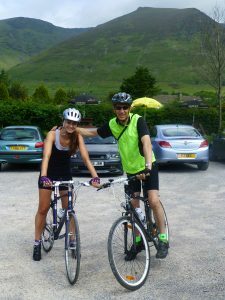 You can sponsor Martin and Grace for their cycling challenge here.